LONDON--(BUSINESS WIRE)--Technavio market research analysts forecast the global residential solar energy storage market to grow at a CAGR of close to 68% during the forecast period, according to their latest report. The market study covers the present scenario and growth prospects of the global residential solar energy storage market for 2017-2021. The report also lists Li-ion battery and lead-acid batteries as the two major technology segments, of which the Li-ion battery market accounted for more than 48% of the market share in 2016. The growing focus of countries in terms of shifting to renewable power generation has led to millions of photovoltaics (PV) systems to be deployed across the world, to meet the power needs. In countries where feed-in tariffs exist, excess power is sent to the grid in exchange for a small compensation. Energy storage systems are complementing the solar PV systems by storing the excess power for later use, thereby increasing renewable power penetration as well as increasing the use of cheaper and cleaner power. There has been a steady investment in research and development by energy storage vendors to develop technology that can reduce the cost of the system. Since 2010, battery cost dropped at an average of 23% per year, which in turn, has led the storage system cost to drop at an average of 14% per year. “The declining cost of energy storage systems has increased the value of residential PV systems. The cost of renewable energy systems will plummet with the continuous increase in their deployment. In the past, the major hurdle for the adoption of renewables was their intermittency and high cost,” says Thanikachalam Chandrasekaran, a lead analyst at Technavio for energy storage research. Feed-in tariffs are a fixed payment given by the government to a resident or commercial building that generates electricity from renewable power and sells it to the grid. It is a long-term government measure to accelerate investments in renewable power. Feed-in policies have been the most prominent form of regulatory measures taken by the government for renewable power generation. The number of countries with feed-in has increased from 14 countries in 2000 to 110 countries as of 2016. Countries such as the US, the UK, Germany, China, and Japan have solar feed-in tariffs. Energy storage systems are the next logical step to accelerate the transition to renewable power generation and increase the savings gained from feed-in policies. In a typical scenario, a solar PV system generates power and the excess is sold to the grid for a lower price, and when the PV is not meeting the power needs, power is bought from the grid. However, adding an energy storage system leads to higher savings, as it reduces the dependency on grid power. This is one of the driving factors for energy storage adoption in the residential sector. Growing population and urbanization worldwide have led to the continuous growth in global electricity generation. As a result, utilities are running plants at full capacity to generate more power from the existing infrastructure. Owing to the increased power production, there is a gradual increase in power prices. The rising energy cost has led to the adoption of energy conservation measures such as generating their own electricity. “The multiyear decline in solar PV technology costs has made it competitive with grid electricity prices. The availability of energy storage increases PV penetration, which, in turn, increases self-consumption and helps to reduce the rising energy bills. Residential systems with solar power and energy storage can protect themselves from grid power outages and achieve energy independence,” says Thanikachalam. 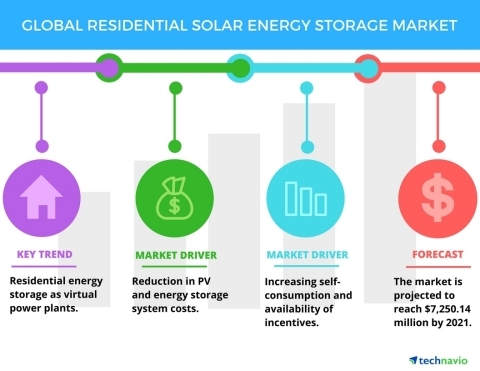 Technavio market research analysts forecast the global residential solar energy storage market to grow at a CAGR of close to 68% until 2021.